This high-interest video, documents the work of James Balog, a photographer and nature cinematographer, who travels the earth's icy regions in order to document the effects of global climate change. In this video, Balog visits glaciers in Alaska and Greenland. The video documents Balog's efforts to create time-lapse videos of glaciers which vividly display the denudation of earth's ice in recent times. Massive glaciers are seen to retreat in the span of a few months. In Greenland, Balog explores the ice cap along with other scientists. The Greenland ice experiences melting during the summer months, with fresh-water lakes appearing and rapidly disappearing. 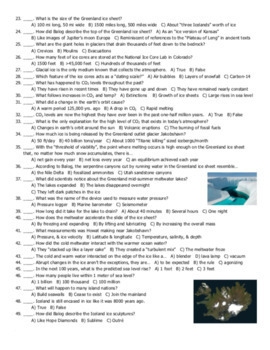 The work of many other climate scientists is also documented as they attempt to understand the mechanisms behind the apparent speedup of the ice melt. 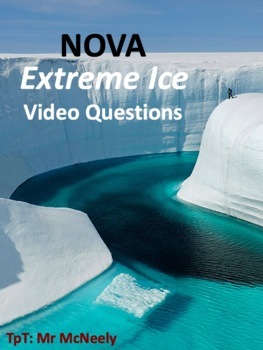 NOVA's Extreme Ice presents all of the major evidence for climate change, such as ice-core evidence and carbon dioxide's link to global warming, and the video is a nice alternative to other climate change media such as An Inconvenient Truth. Balog's adventures are exciting, and he is a passionate advocate for science education and earth stewardship. 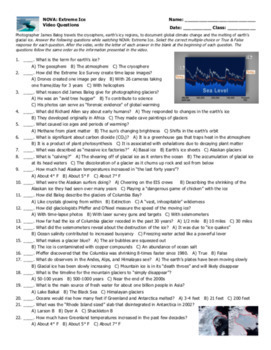 The ZIP file contains a two-sided video worksheet consisting of 49 multiple choice questions and an answer key. Files are provided in both MS Word and PDF formats. You will need to obtain a DVD of the video, or use the PBS Internet site or YouTube.